The Pilates Chair is a popular piece of exercise equipment not only because it is smaller and more versatile than the other Pilates apparatus, but it is also much less expensive. Joseph Pilates goal was that every home in America have a Pilates Wunda Chair in the living room that fit the décor so you could exercise while visiting or watching television. Many of us have treadmills and bicycles stuffed in the corner that they planned to workout on while watching television. This Chair is much quieter and you can sit, lie, or stand to do your exercise. The Pilates exercise chair is my favorite machine because I can get a great workout in a short amount of time, or it can be so versatile that I can spend a whole hour giving myself or clients a workout on this piece of Pilates equipment. 1. Improves Balance whether sitting, standing, or lying on the chair. 2. Improves Posture through pelvic and scapular stabilization exercises. 3. Works spinal flexion, extension, and side bending through the many different stretching positions. 4. Increases strength, lean muscle tissue and, in turn, metabolic function. 5. Improves mood and energy with the fun and invigorating movements. Check out my 12 Minute Chair Workout on YouTube! Check out my favorite Pilates Equipment Workouts on other apparatus here! Wunda chair exercises not only helps to strengthen the muscles of the legs and feet, but also improves foot and ankle flexibility and pelvic stability. Sit to the front edge of the chair upright on your sitting bones at the base of the pelvis place your feet on the pedal. Work the pedal up and down on your heels, toes, and arches or mid foot. Also, work with your feet in various positions; turned out, in, and pushing the pedal down with your toes keeping your legs still as you do this. Repeat for up to 20 repetitions in each foot position. 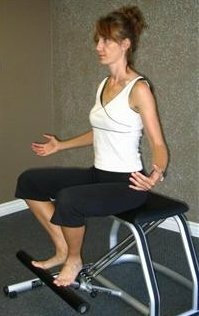 One of my favorite chair Pilates exercises as it not only works the deep stabilizing core muscles, but you get a great upper body and balance workout at the same time. It also takes the stress off your wrist joints. -Lying tummy down on top of the chair with hands pressing the pedal down. -Bring your hips to the front edge of the chair and find your balance like the fulcrum on a teeter totter. -Come up until you are parallel to the floor then begin your pushups pulling the pedal up towards your chest and then pressing the pedal away. -Exhale as you push away pulling your deep abdominal muscles up and in to keep your body still. -Repeat for up to 20 repetitions or to fatigue. See this pushup exercise on a stability ball here. This is a great stretch for the whole upper body. You will especially feel it along the side of the spine stretching from your ribs to hips and all along the extended leg. Sitting sideways on your chair with your hand closest to the pedal reach and press the pedal down while reaching the opposite hand to the ceiling. Exhale as you press the pedal down bending sideways as you lift your ribcage to the ceiling and slide your shoulder blade down away from your ear. Keeping your outside leg anchored lift your chest high pulling yourself back up tall to the start. Many of you have seen Malibu Pilates on TV and I have had the opportunity to use this chair with one of my clients. I would say that for home use this is a fine piece of Pilates equipment and it gets the job done for half the cost of a studio chair. Malibu Pilates has updated this chair recently and it is safe and sturdy and ready for home use! Leave Pilates Chair workout and check out all the free information and articles here on my site about Pilates.